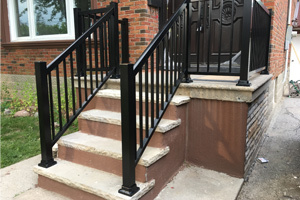 Aluminum Outdoor Railings | Global Aluminum Solutions Inc. Choose aluminum and glass railings for your porch and give your home a new, vibrant and fashionable look that will last decades. Aluminum railings for your porch are great investment in your home. Your deck is the ideal place for relaxation. 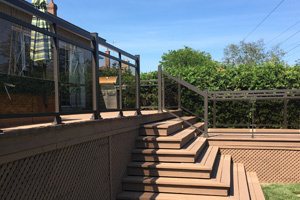 Choosing aluminum and glass railings you get both a touch of elegance and an unobstructed view of your beautiful garden. 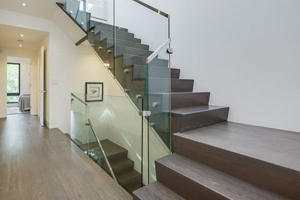 Nothing says “modern design” as glass railings. They don’t just provide support and safety; the combination of stainless steel and tempered glass lends a classy look to any residential or commercial building. 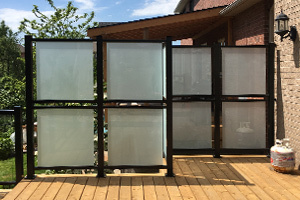 For those homeowners who looking for privacy of their decks we offer glass privacy screens. You can choose sandblasted or tint glass. Available heights are 4′, 5′ and 6′.